On its initial release, Google+ was met with mixed views and opinions in the social media sphere. Many who were quick to sign up in the platforms opening phase dismissed it as limited, and questioned its viability as a tool for social commerce and marketing. Here are some compelling reasons as to why your small business should still invest time on Google+ Marketing. Within the platform, Google+ has embedded an array of features which allow the user to make their content more prominent and therefore more viewed. One of these features is the ability to display your Google Plus profile picture next to your page when it appears in relevant Google searches. Users simply select the rel=author or the rel=publisher tags, in order to display their small business Google+ profile picture via Google searches. Due to the fact that the majority of small businesses make use of their brand logo as their Google Plus display picture, this is fantastic brand advertisement and a great way to establish online brand recognition. 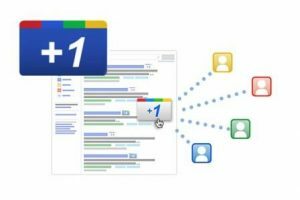 The +1 feature on Google Plus has become the online gold standard of social approval; what’s more it is displayed throughout the internet. The volume of +1’s your business has is a clear sign as to your reputation, but like all social media, you have to be involved. Furthermore, your business’ Google+ page is automatically integrated with your Google+ Local page, therefore linked to your content and providing further online legitimacy. It is no secret that Google is a massive fan of social media. This is largely because a search engine’s role is to provide the most up to date and relevant answers to any online queries or questions a user may have. Social media provides search engines with a tangible way of measuring the validity and usefulness of information through likes, shares and in the case of Google+, through the +1 feature. It is no secret that the higher the +1 ranking your page, blog or content receives; the higher Google ranks it in search results. Although sceptics claim Google+ Communities to be extremely similar to LinkedIn communities, there are some notable differences. The main difference is that LinkedIn, as unfortunately to a large extent become saturated in self-promotion driven spam, whereas Google+ has remained spam free. Furthermore the Google+ communities are immaculately moderated, with a clear emphasis on encouraging high quality and engaging debates and discussions within the communities. This makes communities the place to be for finding relevant and high quality content and contacts easily. The primary asset which Google Plus has over LinkedIn is that it is not purely business centred. Users are free to engage in their interests and hobbies via the platform, this enables users to build much deeper connections with their connections than on LinkedIn. 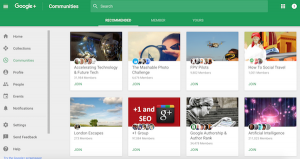 Google+ Collections are similar to Communities in that they are built around shared interests, but there’s a difference in who controls the content. Collections allows you to create content collections around topics and interests and allows your followers to choose the type of posts they want to see from you. Collections can be shared publicly, privately or with a specific set of users. Spam Email – Stop Your Inbox Getting Littered!